The goal of this is to gain a better understanding of other people based upon their inspirations for the stories they share. The goal of this is to take a look at the world through someone else’s eyes to gain a new perspective. The goal is to see if people’s benefits or disadvantages would elevate or hinder their progression or advancement in the room as a representation of how it could be in life when you’re “different” than everyone else. This is the first paper prototype for this class. The concept for this project comes from another project designed by an artist named Rashid Rana. In his installation, “I do not always feel immaterial”, he showed the audiences how themselves look liken when they were looking at a painting. Inspired by that idea, I also want my audiences to change perspectives in similar way. To achieve that goal, I would set a room as my project. In side the room, there will be a box on the desk in the middle of it. The box would be set as same as the real room and have a small doll inside it. As long as audiences get into this room, the kinect will track the movement of them and reflect on the doll. Therefore, players can see clearly how themselves move in this magic room. our mechanic is to give clues(but not enough information) to the players to figure out what happened. I want to make an immersive environment that people can experience the life of ghost and ghost exist in our world. Basically, I will make a virtual room that same as our classroom or my bedroom. There are two persons can engage in this experience. One sitting in front of the computer(the virtual room that I created) play as a ghost. He or she can trigger some environment objects, sententiously, in the physical room(my bedroom ) will also be influenced. The other persons will stand in the physical room, using a camera(made by Arduino) to capture the ghost. The ghost’s goal is triggering all the item in the virtual world and avoiding be captured by the player in the physical world. When the ghost trigger items in the virtual world, same objects in physical will also have feedback. 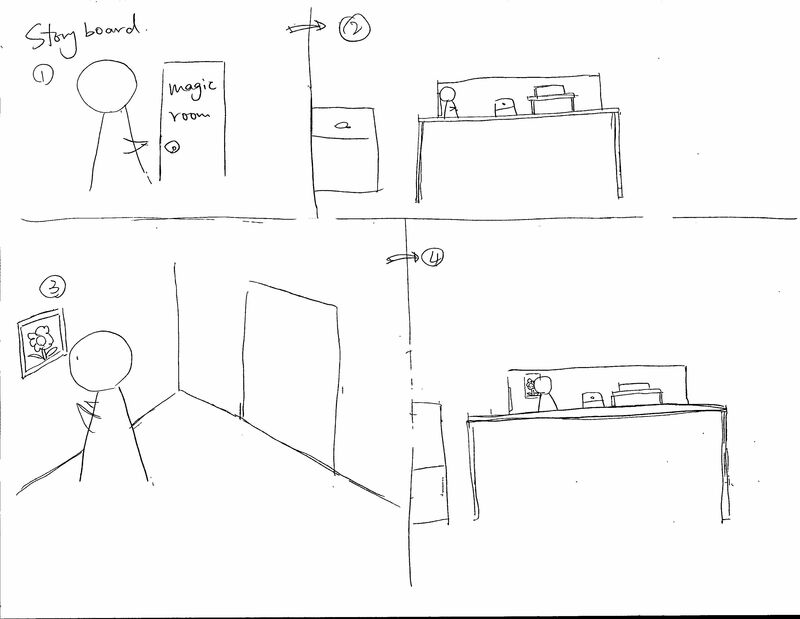 Therefore, according to these clues, the physical world player can use the camera to capture the ghost. Furthermore, there is sound feedback. The player can hear the sound which generates by the ghost. The player also can recognize the direction of the sound. The goal of the player in the physical world is trying to capture the ghost, by using those clues and sound feedback. The player has 3 chances to capture the ghost. If the player captures the ghost within 3 changes, he/she win. If not, lose. Or if ghost trigger all the items, Ghost win. This prototype Geyao and I want to use sound as an instrumentality to change people’s perspectives. Basically, we use heart beat. So we want people to evaluate each other by hearing heartbeats. There is a completely darkness room, and we need 10 or more people to participate in, and each of person has a stethoscope, and each of them wears a T-shirt with a light stick around their heart position. It can help people find where is the heart position in the darkness room. So base on that, people hear others’ heartbeats by using a stethoscope in the darkness room, and find the most beautiful heartbeats, and then stay with he/she. So when light up someone may stay with the person with whom they never want to make a friend. Why in the darkness room? And why using heartbeats? So we want to use darkness to remove everything. Such as, skin color, appearances, gender, privilege. The only thing left is heartbeats, and almost everyone’s heartbeats hear same. So we want to use that to achieve an identity. Geyao and I want to create a cooperation game. To win the game two players have to communicate with each other. So in this process, they will change the perspectives. This is a multiplayer Jenga game, and the computer will be divided into two section that is left and right. There is a fence perpendicular to the screen and at the middle of the screen to limit the information they can get on the screen. Their goal is trying to escape the little man on the top of the tower. P1(the right side player) has a panorama view, and he/she can remove the bricks. However, P1 doesn’t know which brick will blow up the tower. However, once the player-one’s mouse hover on dangerous brick. A sound warming warning will play for player-two. Therefore, the player-two can warn the player-one. The P2 can control the little guy on the top of the tower. P2 has a first person’s view, and he can turning his views to check and know which brick to decide move direction. So they should talk to each other and figure out how to rescue the man on the top of the tower. In this process, they will change the perception. the figure of computer and fence. The win condition is that let the little guy safely landing on the ground. I thought Dan Archer’s talk was very inspiring as I am really interested in how stories in the news are told. Expanding journalism beyond the written word is something that is emerging as our technology evolves. Every medium lends its own representation to an event, or as Marshal Mcluhan says — the medium actually IS THE MESSAGE! This little phrase took me a long time to wrap my head around, until I realized that what he is saying is that the way we communicate defines what it is we communicate. Stories are hard to tell. How do you describe a moment in time? Can a news event really be summed up by one overlying story? Aren’t stories and news events more of a combination of perspectives? I think so. Therefore, telling a story is an art form. The medium used to tell the story lends to the way the art is perceived in the end. For example, a painting of a rose in watercolor communicates something very different than one painted in acrylic. In terms of VR, I think it just offers us another face to a story. VR is not truer to a story because it immerses our vision in a 3D world, but it does lend a new interpretation. The language of communication it uses is completely different from writing a story, but each has the capability of storytelling. VR will not take over writing, photography, or film making. It is an interesting medium in that it immerses a persons VISUAL SENSES to the confines of a world that an artist builds. Nevertheless it is just another medium, not one that renders writing, photography, and film making obsolete.